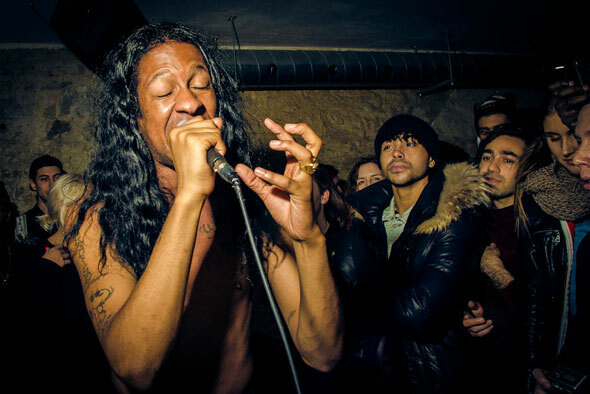 Sporting a tight weave and knee-high combat boots Harlem's transgender rapper Mykki Blanco grabbed the mike at Bambi's for her second performance of the night after her opening set for Death Grips at Wrongbar. This was an afterparty that was announced just a few days earlier, but the crowd was lined up and ready for the self-proclaimed "rookie of the year." Blanco's short set featured songs from her new mixtape Cosmic-Angel: The Illuminati Prince/ss. The highlight was watching Blanco crawl the walls thru a never-ending acappella freestyle that had her clawing the air and sent her eyes rolling to the back of the skull. It all ended with the Brenmar produced single Wavvy. The crowd was hanging on her every word, every twitch of a wrist--they were living. Blanco's performance was a hip-hop exorcism: a little grungy, unapologetically raw and a maybe more than a little fucked up. What more could you ask for on a cold Sunday night on Dundas West? Writing and photos by Alejandro J. Santiago who came for the music but whose real mission was to snap some shots of Ms. Mykki (she was more than willing). Check out the photos on his blog.